Soybeans are looking great in Eldridge, Iowa. This soybean SuperStrip™ plot also includes the newly approved trait package LLGT27® soybeans. Many of these plants have 4-bean pods. All we need is some August rain to fill the pods! The picture below shows the stark difference of soil type within the field. You can see the top of the hill is severely affected from drought like conditions where the soil has higher clay content. 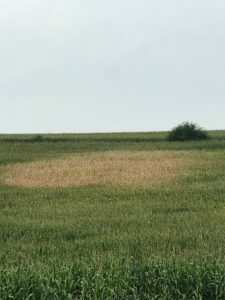 These areas are turning brown and prematurely dying off. Here is a picture of our popular LH 5245 VT2 PRO RIB in Butler County. Corn is coming along really well. Most of the corn is dented in that area. In another month, harvest could be underway. 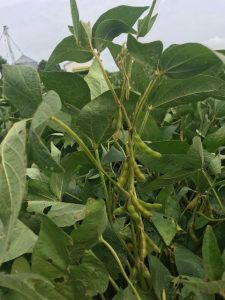 Rain fall last week ranged from 1 to 4 inches, so that will help fill the pods in soybean fields. 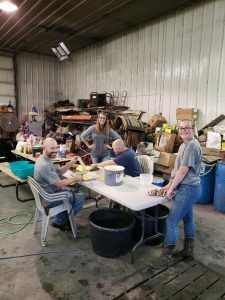 We are cooking and freezing sweet corn today at the Sandven Farms! Picture includes Latham® dealers Tyler & Michelle Sandven, daughter Sydnie Sandven and brother Craig Sandven. Those who also helped but are not pictured: Rylie Sandven, Cindy Sandven, Braydon Sandven, Doug Sandven and summer help Jake Heslop. They used Grandma Joann Sandven’s recipe. 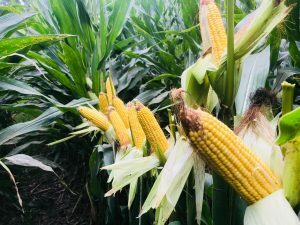 We saw tremendous ear size when we were out scouting this week. 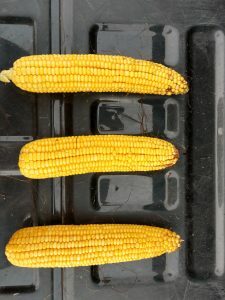 All three were planted on May 10th in the Garner, Iowa region. Top hybrid pictured is LH 4454 VT2 PRO RIB 16 kernels wide and 40 long at 35,000 final stand. Middle hybrids is LH 5099 SS RIB 16 kernels wide and 38 long at 36,000 final stand. The bottom hybrid is LH 5245 VT2 PRO RIB at 18 kernels wide and 42 long at 36,000 final stand. We had a successful day scouting fields this week! We were happy to see the clusters and 4-bean pods all the way to the top of the plant on Latham L 2184 R2X soybeans. Look forward to seeing the results this fall. Latham LH 6069 SS RIB is out performing the competition in Mapleton, IA. 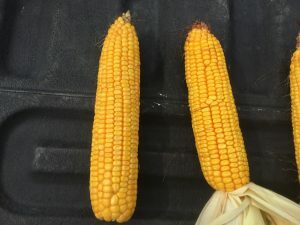 This hybrid has an average of 16 kernels wide and 36 kernels long. There are approximately 32,250 ears per acre. We are looking forward to harvesting this hybrids in the fall! 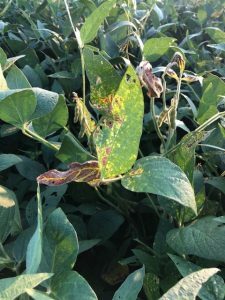 Early signs of Sudden Death Syndrome in soybeans are starting to show up in areas of Southern Wisconsin. 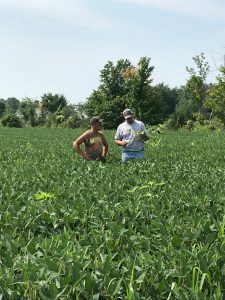 Selecting a soybean variety tolerant to SDS and also using ILeVo® seed treatments are two of your best options to combat SDS and leave yield unaffected. Call me for an in-field evaluation to determine if ILeVo seed treatment should be on your soybeans in 2019. 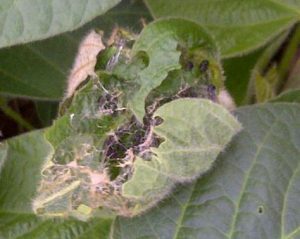 We are now starting to see white mold pressure in areas with heavy rains this season. Keep in mind that if white mold has been an issue, your best future defense is selecting seed with good white mold ratings. 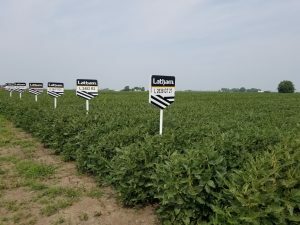 Only Latham Hi-Tech Seeds offers IRONCLAD® soybean brands. We can work with farmers to choose the right soybean products on a field-by-field basis. It will be fun to watch the tolerance of some of our defensive varieties over the next few weeks in plots. In photos below, a new Latham Dealer and I were scouting for aphids. Aphid numbers were very high but not to threshold. They will monitor the aphid population over the next few days to see if spray is warranted. Another good year for American Crystal Sugar Company of the Red River Valley. Opening of fields was Tuesday, August 14, 2018! They started earlier than usual and above normal temperatures have given the growers a very good crop this year! 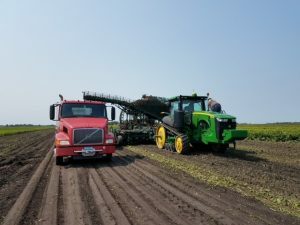 This picture was taken Tuesday on the farm of Riverton seed in Glyndon, MN. 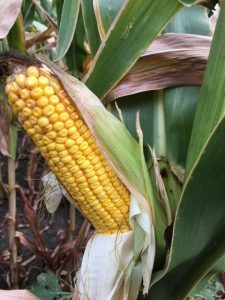 We spotted have denting corn in Southeast South Dakota! While many fields I have been in this week are still in the milk stage, a few are beginning to dent. Early planted, early maturities, and the moisture (drought) stressed fields are moving right along. Some areas have reached moisture stress levels. I’ve also seen a few soybean fields that could really use a drink of water to fill those pods. As a cold front moves in, watch aphid numbers. Temperatures of 75 to 83 degrees Fahrenheit are prime for aphid reproduction and they reproduce very quickly! A few areas have hit threshold levels (250/plant). 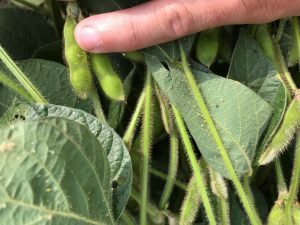 Most soybean fields have a couple of weeks before they hit that R6 stage where aphids are no longer a concern or threat. Scout, scout, scout! Do NOT spray until insect pressure has hit threshold levels in YOUR field. Economic threshold for aphids is 250/plant. Dry weather has been the theme for the past few weeks in Northeast North Dakota. Very little rain has fallen and above-normal temps are taking their toll on the crops. Soybeans are wilting and corn is firing on lighter soils. We hope the expected cooler weather with a chance of rain makes it’s way here! Yields look to be best on the Eastern and Southern parts of my territory. Corn is now in the milk stage and soybeans are beginning to fill seeds in the pods. 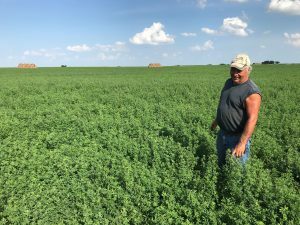 Pictured below is Latham’s Branch Root Alfalfa. It has customers impressed! This is third-year alfalfa. While inspecting soybean fields for aphids, also look for this pest. 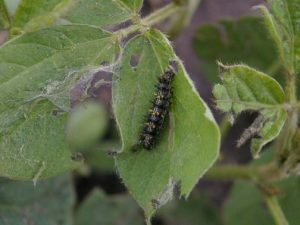 Thistle caterpillar can cause significant damage with leaf feeding. More extensive damage can be seen where upper leaves are rolled together with a web-like fiber. According to Iowa State University, economic thresholds are seldom reached. If you find an insect on approximately every other plant or see about 20-25% leaf feeding, consider insecticide applications. 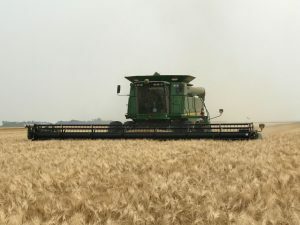 Small grains harvest across the state is in full swing. There are quality issues in wheat this year with high (rejectable) amounts of ergot found in some areas. Yields are all over the board as moisture accumulations across a widespread area of the state has fallen to a four-week lull. Later season crops, especially the soybeans, are digressing by the day. Whole fields of both soybeans and corn are dying. 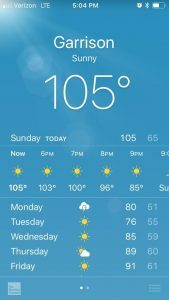 We hit a 10-day stretch of extreme heat with highs in the triple digits 4 four of those days, topping out at a miserable 105. Cattle in the western part of the state died of heat stroke. We are seriously in need of rain for the second year in a row. Grain corn is starting to be chopped for silage. If we miss out for the next week or so, a lot more acres will be added to the pile.